Around 700 new houses will have to be built in the district in the next year, the local council has revealed. The new, higher figure is because the council has fallen behind its new annual housing target. And as a result, the council admits planning applications for housing in the Harborough district will have to be treated “more sympathetically to try to raise the build rate”. Once the shortfall is remedied, the council hopes to settle into its “normal” annual house building quota. Even that – at 475 houses a year – represents a 35 per cent increase on the 350 annual housing target the council was previously working towards. It means that over a period of 20 years, about 9,500 homes – the housing equivalent of Market Harborough – must be built across the district. The council now believes the Government is pushing Harborough to build too many homes in the district. “We’re following Government guidelines. We haven’t got room to manoeuvre,” said Stephen Pointer, the council’s strategic planning services manager. “We might create the cake, but the Government supplies all the ingredients and the recipe,” agreed Cllr Phil King, the district council’s portfolio holder for planning. Another complicating factor comes from the house builders themselves, who may not build at the rate the council requires. 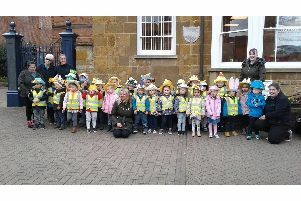 “It’s not all bad news for Harborough though,” said Cllr King. “New building does bring in the council tax, and of course population growth, migration to the district, people living longer, and people forming households at different rates means we really do need new homes. It was an independent consultant, employed by the district council, who came up with the 475 figure. “And we realised we’d also have to catch up with what the market didn’t deliver in previous years,” confirmed Mr Pointer. He said the council has consulted various experts and even planning barristers about the housing targets. So what does the average Harborough man or woman on the street make of the housing targets? Alan and Valerie Ward, who have lived in Market Harborough for 30 years, said the town was growing too quickly. “I personally think Market Harborough is already big enough,” agreed Mrs Ward. But passer-by Dr Martin Field, a housing expert from the University of Northampton, said: “475 houses a year might not be too much development, particularly if it’s not concentrated on the towns. “I think more life could be given to some of the smaller settlements in the district.